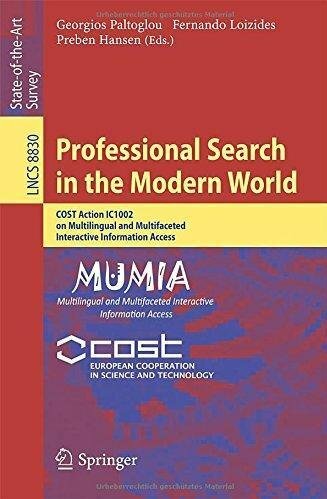 This State-of-the-Art Survey constitutes the Final Publication of the COST Action IC1002 on Multilingual and Multifaceted Interactive Information Access, MUMIA. It contains outstanding research, recent developments and new directions in all related aspects of multifaceted and interactive information access with a focus on professional and enterprise search. The contributions are grouped in the following three parts: frameworks, models and theory; tools, applications and practice; and patent search. The Intellectual Property (IP) domain is used through the book as a primary case study. The book aims to bring together material which has been published in a fragmentary way in journals and conference papers into a coherent whole but also present novel, unpublished work where appropriate.